Bay Crossing 55+ Lewes Delaware An active adult community! Welcome to Lewes Delaware’s premier Bay Crossing 55+ Lewes community. In fact Bay Crossing homes boast membership in the only Sussex County, Delaware 55+ community that is located East of Route 1, making this the place to be if you want to live close to the beaches. Lewes Delaware Homes in Bay Crossing a 55+ community homes are in demand because of the convenient location close to shopping, medical facilities,and plenty of fun. Best of all, if you own a Lewes Delaware Home in Bay Crossing a 55+ community, you will have more time to have fun. Enjoy your retirement, and let the management of this 55+ community take care of your outside maintenance, including lawn maintenance, irrigation, trash pickup, and snow removal. Spend your free time enjoying the state of the art exercise facility well equipped with a full kitchen, bathrooms with showers and lockers, billiard room, an activities room with a ping pong table and a dining room with a dance floor. Other amenities include tennis courts, a bocce ball court, sidewalks, walking trails. Bay Crossing real estate includes both single family townhomes. There are not many lots left, but new single family homes are still available. Bay Crossing homes are quality built by custom builder Blenheim and are Energy Star rated. Expect standard features like basements and two car garages, with yards that back up to wooded areas. When complete, this popular Delaware 55+ community will contain 256 homes, including a mix of 84 attached homes and 172 single family homes. 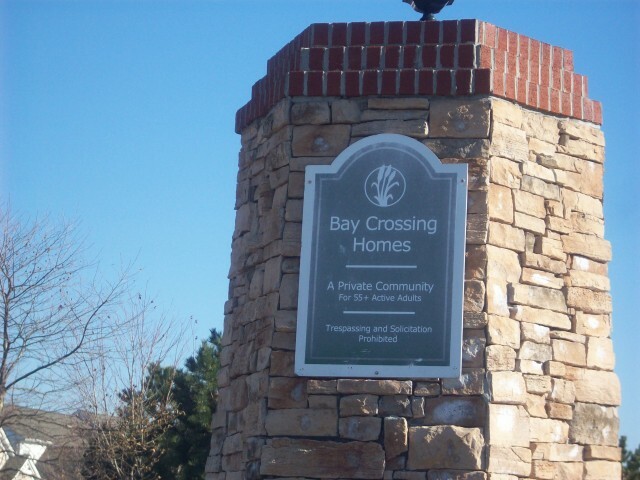 See ALL 55+ community homes in Bay Crossing. For more information about homes in Bay Crossing 55+ community, contact Joe Bowski at (302) 245-8885.